Friday January 18th 1889. I did some sewing today I made Mother a skirt and an apron. She was in town all day. I played on the piano in the evening Will was in town after supper. Saturday January 19th 1889 I helped some with the work in the forenoon. Grand-ma came for a visit and Uncle Jacob was here for dinner weather cold and threatening snow. I read most of the evening. Sunday 20th I was busy reading a book all day only when helping get the meals. 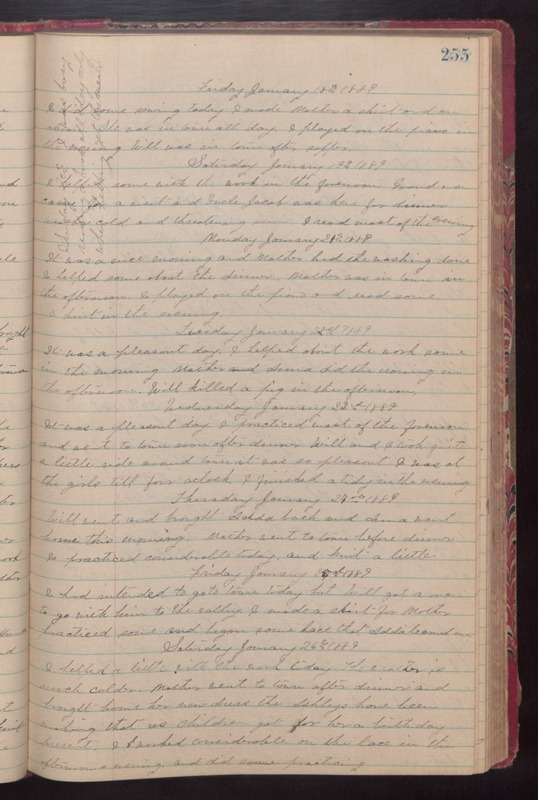 Monday January 21st 1889 It was a nice morning and Mother had the washing done I helped some about the dinner. Mother was in town in the afternoon. I played on the piano and read some. I knit in the evening. Tuesday January 22nd 1889 It was a pleasant day. I helped about the work some in the morning Mother and Anna did the ironing in the afternoon. Will killed a pig in the afternoon. Wednesday January 23rd 1889 It was a pleasant day. I practiced most of the forenoon and went to town soon after dinner Will and I took quite a little ride around town it was so pleasant. I was at the girls till four oclock. I finished a tidy in the evening. Thursday January 24th 1889 Will went and brought Adda back and Anna went home this morning. Mother went to town before dinner I practiced considerable today. and knit a little Friday January 25th 1889 I had intended to go to town today but Will got a man to go with him to the valley. I made a skirt for Mother practiced some and began some lace that Adda learned me. Saturday January 26th 1889 I helped a little with the work today. The weather is much colder. Mother went to town after dinner and brought home her new dress the Ashleys have been making that us children got for her a birthday present. I worked considerable on the lace in the afternoon and evening. And did some practicing.